Professor Peter Shepherd, University of Auckland. Friday 4th September 6 pm Presbyterian Community Centre, Tenby St. $5 admission. Professor Peter Shepherd will demystify the science behind the many different types of sugar that we have in our diet. He will go on to show how too much sugar causes problems for our body and go through what we now know about how obesity develops and how we might successfully address this problem in the modern world. Is coconut sugar really good for you ? Are fizzy drinks bad for you ? What does Stevia do ? Its not as simple as it seems but hopefully this won’t put you off your dinner too much. Peter Shepherd is a professor at the University of Auckland and his lab studies the signalling pathways that regulate everything that happens in our cells and how these process go wrong in diseases like cancer, diabetes and schizophrenia. He is a native from way up north past Kaitaia and studied in NZ before research positions in Boston, Cambridge and London. He returned to NZ in 2004 and is currently deputy director of the Maurice Wilkins Centre and chief organiser of the annual Queenstown Research week which brings hundreds of researchers from all over the world to Queenstown in late August each year. 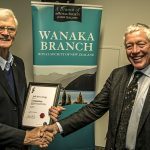 This year he is co-organiser of an effort to bring some of that science to the public of the Central Otago region through a unique joint venture with community groups called Question It ?